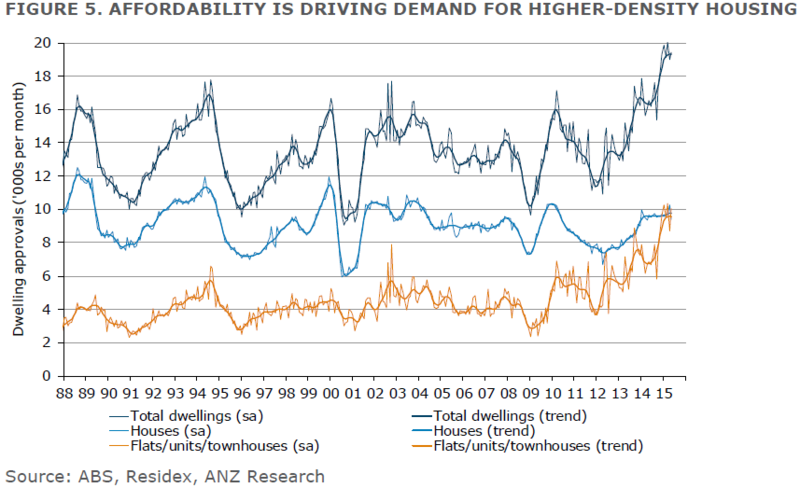 Housing affordability is back on the agenda, according to the latest ANZ economic insight report. Low mortgage rates and soft rental growth have improved housing affordability for mortgage holders and renters. 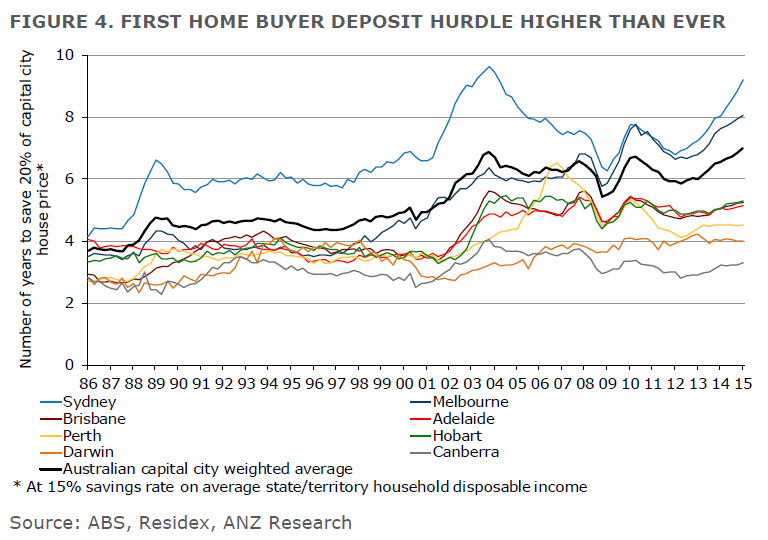 On the flipside, strong price growth has ensured house deposit affordability is at an all-time low. As an understanding of supply and demand is vital to successful property investment, it is well worth a read. Housing affordability is a problem for some, but not for others. Despite a long-term trend decline in home ownership rates, in 2011-12 more than 2 out of 3 Australian households (approximately 5.8m) were home owners (30.9% of all households owned their dwelling outright and 36.6% owned their home with a mortgage). For these households, strong home price growth has boosted household wealth, while lower mortgage rates have additionally eased mortgage servicing costs. However, home deposit affordability is an issue specifically for households either as they form (ie mature age ‘children’ that want to ‘move out’ of home), or as they change from renters to home owners. This difficulty has been evident in lower household formation rates over the past seven years and weak first home buyer mortgage lending following the surge induced by the First Home Owner Boost in 2009. Debate continues about the impact of policy, such as negative gearing and capital gains tax concessions, particularly in response to strong investor housing demand and price growth in Sydney. However these factors have existed for around 30 years and 15 years respectively. What has changed recently, and is more likely to have driven the house price response, has been further cuts to interest rates. As expected, this has attracted investors to the housing market and developers to ramp-up construction levels of much-needed new housing. This positive supply response to lower interest rates is likely to ease housing affordability across all household types in the coming years. In the near-term though, increasing home prices combined with soft household income growth will maintain difficult home deposit affordability conditions. Essentially the argument about whether the current market is defined as a bubble has little to do with the growth in prices alone (the growth in Sydney house prices is not unprecedented), but more importantly is there a risk of prices falling sharply over a short period of time. As experienced in the early 2000s, a structural lowering in interest rates was capitalised into a new normal level of house prices – and house prices relative to household income. In the wake of the Global Financial Crisis, Australia has not been alone in driving interest rates to multi-year historical lows, in response to subdued economic growth. Fortunately for the Australian household sector, the Australian economy and housing market have not experienced the downturns of many other developed economies in recent years (Figure 3). Despite fears that interest rates are artificially low and could quickly revert back to pre-GFC levels, the consensus view is that interest rates will likely stay at-or-near the current low for years to come. 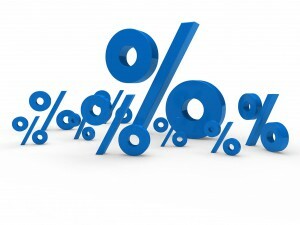 Consequently the lower discount rate housing investors apply on future gains can justify a higher present value. Combined with strong underlying supply-demand fundamentals for housing, this indicates house prices are approaching a higher ‘new normal’ and home deposit affordability is likely to remain difficult for new entrants. 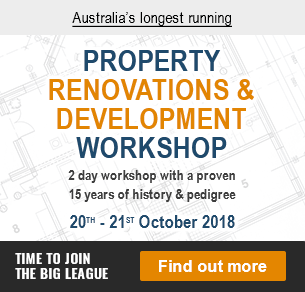 Where can I buy an Australian house? The Australian housing market is often referred to as an aggregate market. However, just as consumers don’t go to the supermarket to buy a ‘grocery item’ (ie they purchase milk or washing detergent, etc. ), home buyers can’t buy an ‘Australian’ house. 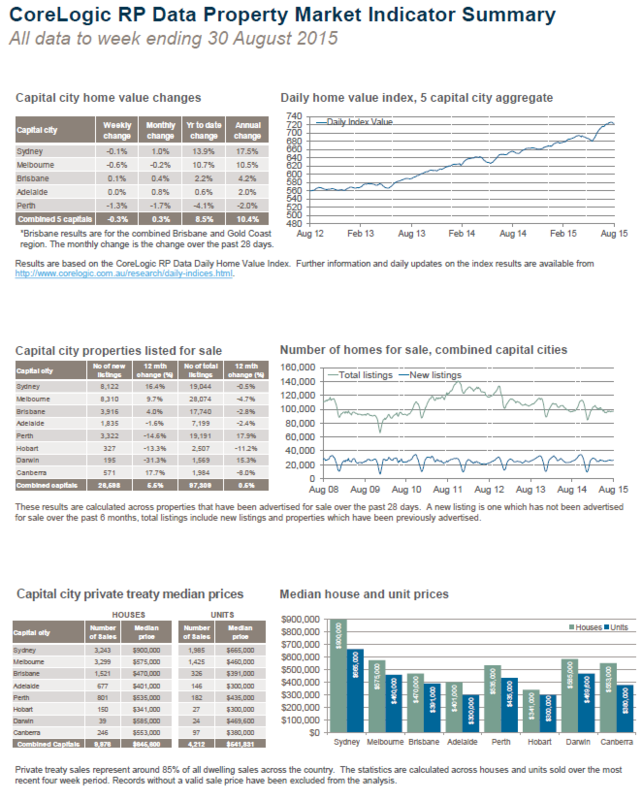 Consequently, divergences in Australian state and regional housing markets are important to identify. That is, the relative strength, or otherwise, of specific economic and housing market conditions will determine price growth and housing affordability in each individual market. As highlighted by the RBA, the recent risks to investor lending are prominent in NSW, where investor lending has increased by around 140% in the past three years. This sharp increase in lending has driven Sydney house prices over 40% higher in a little over three years, compared to household income growth of only 6.5% in NSW over the same period. This sharp increase in house prices combined with low income growth has resulted in households needing to save for an additional 2½ years for a 20% house deposit in Sydney. 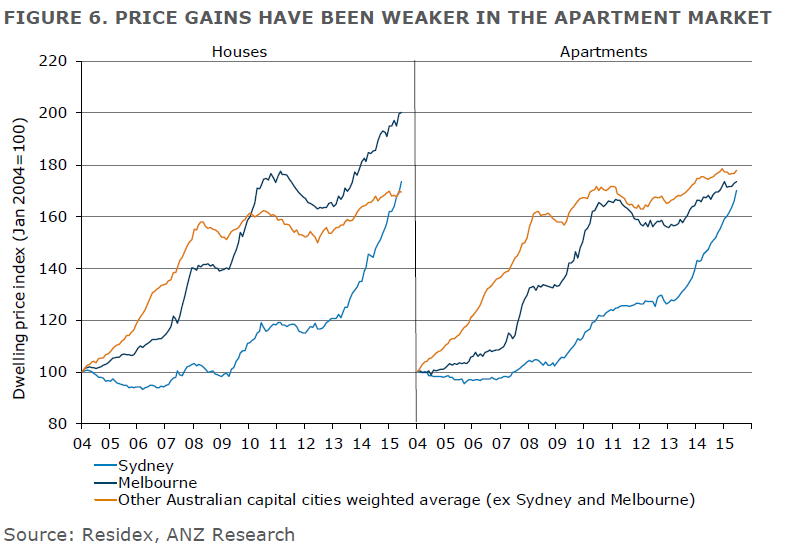 However, this has had little-to-no bearing on home prices and affordability in other markets across Australia. In contrast, home price gains outside of Sydney (and Melbourne) have been more subdued. 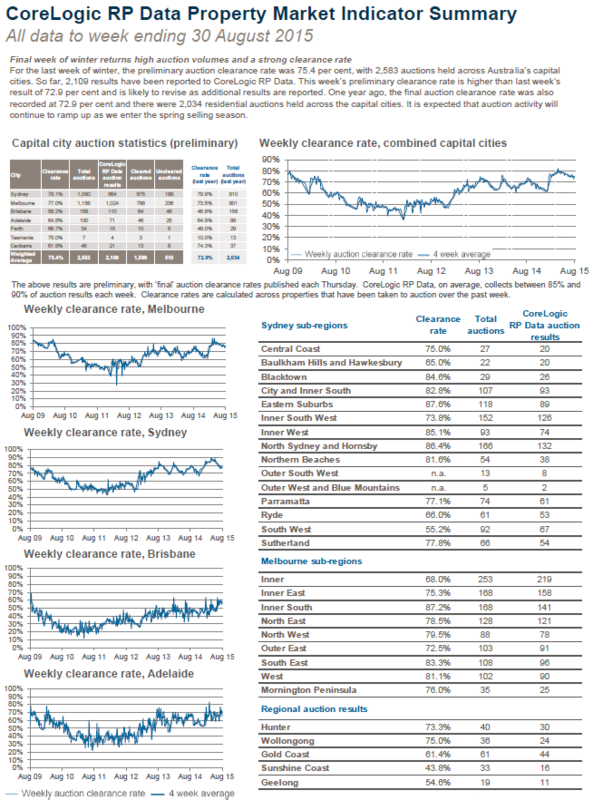 There have been comparatively favourable (and less volatile) home deposit affordability conditions in Brisbane, Adelaide, Perth, Hobart, Darwin and Canberra (Figure 4). Looking ahead, while deposit affordability for detached houses is expected to remain difficult, a sharp increase in the supply of new apartments in the coming years in Sydney, Melbourne and Brisbane will lift the supply of housing at a lower price point. However, given the high proportion of households living in detached houses this transition will likely challenge existing preferences for households looking to become home owners (Figure 7). In the absence of significant changes in housing policy/taxation or economic conditions, recent trends in housing affordability and home ownership are likely to continue. That is, home owners and investors are likely to benefit from low mortgage rates for years to come, while first home buyers will continue to find home deposit affordability more difficult than previous generations, unless they compromise on current housing preferences. 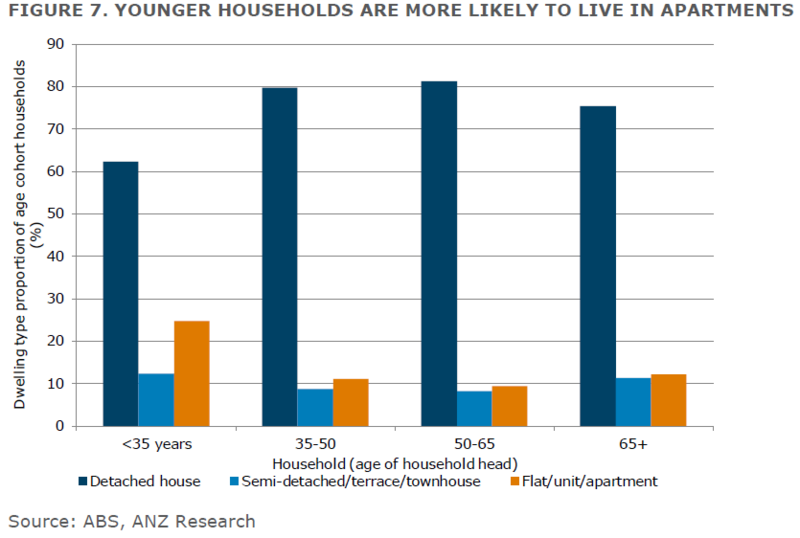 A recent ANZ analysis highlighted that the wealth effect from recent house price gains has been subdued, particularly for older households. However, savings rates for younger households have also increased since the GFC. Given younger households generally have less wealth, and are more income-dependent, expected soft household income growth in the coming years will also thwart home deposit affordability. These factors are also likely to constrain consumption growth in younger households may, at least compared to previous generations. In addition, investor demand for housing, particularly in Sydney and Melbourne is likely to remain strong for years to come in response to volatile global markets, low yields and an uncertain global economic outlook. 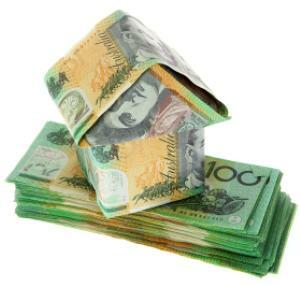 This is likely to drive further wealth gains for existing home owners. It will also continue to support a strong supply of rental housing, maintaining the relative affordability benefit of renting.